As a parent or nanny, you play a vital role in teaching your children about health, posture and illness prevention. Even though your child may be maturing and developing as an independent individual, he still needs your encouragement and advice to learn the basics of how to care for himself. Through educational activities, discussions and real-life examples of healthy habits, you can foster a child who is conscious about how to maintain the best health and posture. It’s not uncommon for many children to resist bath time or the task of washing hands before and after meals; however, you can enlighten them by discussing the results of healthy behavior. The Sandbox Learning Company, a team of experts offering online resources for childcare and education providers, recommends using simple language to explain why preventative behaviors are crucial to good health. Beyond discussions about why good health practices are important, parents and nannies can utilize visuals to serve as a reminder for their children. Pictures, drawings and creative word art displayed in your home and even created by your children can help them remember to get a coat when the weather is cold, throw tissues away after use and flush the toilet. You can even get creative while teaching healthy habits. If you want your children to wash their hands for at least 30 seconds, sing a song or dance around until the time is up. They will eventually learn how to time themselves when they wash their hands. Brushing teeth is another opportunity to improve your child’s healthy habits. Purchase a toothbrush with a timer or one that plays a song so they brush for at least two minutes. The bells and whistles will make these habits much more memorable and fun. Since obesity is a major health risk for children and adults, it’s important to model healthy eating practices for the children in your care. Instead of making your children a healthy meal while you chomp down on fatty foods, make healthy meal preparation a group effort. Encourage your children to suggest and research foods and recipes that provide health benefits and launch your very own cooking show, complete with a video to share with friends and family. 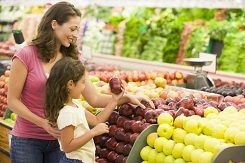 When you show them that you are invested in healthy habits, your children will likely follow suit. Since your children often look to you for examples of how to behave and lead a healthy lifestyle, get active and bring them along, recommends Dr. Wendie Trubow, physician and quality director of Visions HealthCare in Wellesley, Massachusetts. “Go for a walk, play outside and turn off the TV and electronics,” she says. One of the most overlooked healthy habits is posture. Without good posture, your children will likely experience physical ailments that can affect their ability to walk, run and lead an active lifestyle. Teach them early on the importance of posture by exploring its importance to their happiness. According to Trubow, if you stress that good posture leads to how much bigger they will look with a healthy spine, they will likely understand the importance of standing up straight. Should You Tip Your Nanny? How Much? How Often?